The Totem Circle Tour is a 2500 kilometre (1550 mile) tour perfect for those interested in exploring the rich culture of British Columbia’s First Nations people. Passing through historic sites and villages will bring you face to face with diverse people, unique art, centuries old stories and fascinating history. Witness the province’s most beautiful and awe-inspiring scenery as you travel over land through the heart of the province and sail the Inside Passage down through the coast’s magnificent fjords and rainforests. This tour can take anywhere between one and two weeks. Several towns and cities along the route are not mentioned here but stop by the Visitor Info Centre in any community to learn what services and attractions are offered. From Vancouver, travel Highway 7 east to Yale (171 kilometres / 103 miles). Head up the Fraser Canyon to Cache Creek (169 kilometres / 101 miles) and take Highway 97 north to Quesnel (324 kilometres / 194 miles). Take a side trip out to Barkerville (88 kilometres / 53 miles), and then head back up Highway 97 to Prince George (119 kilometres / 72 miles). From Prince George, travel west along Yellowhead Highway 16. Vanderhoof is the first community (97 kilometres / 58 miles), then Smithers (175 kilometres / 105 miles). Prince Rupert (353 kilometres / 212 miles) is the farthest west you can travel on Highway 16 while still on the mainland. BC ferries has service to Skidegate Landing on Haida Gwaii (approx. 6.5 hours) and through the Inside Passage to Port Hardy on Vancouver Island (approx. 15 hours). Take the ferry back to Prince Rupert and board a ferry that takes you down the Inside Passage 507 kilometres (274 nautical miles) to Port Hardy on Vancouver Island (approx 15 hours). From Port Hardy, travel south on Highway 19 to Campbell River (238 kilometres / 143 miles). Courtenay is further down the island (45 kilometres / 27 miles), and at Nanaimo (108 kilometres / 65 miles), Highway 19 becomes Highway 1. Duncan (51 kilometres / 31 miles) and then Victoria (60 kilometres / 36 miles) are the final stops on the tour. BC Ferries sails from Swartz Bay to Tsawwassen (1.5hours). Start the tour in Vancouver at the University of British Columbia. The Museum of Anthropology is a modern coastal longhouse designed by renowned Canadian architect, Arthur Erickson. It houses the most extensive collection of aboriginal artwork and cultural artifacts in all of Canada. Ancient totems from the Haida, Gistxsan, Nisga’a and other First Nations stand beneath 15-metre glass walls inside the museum’s Great Hall. Other exhibits include Bill Reid’s famous cedar carving, Raven and the First Men. Head 87 kilometres (54 miles) east on Highway 7 and you’ll find the Xa:ytem (Hatzic Rock) National Historic Site and Interpretive Centre just outside of Mission. Tours of the 9,000 year old village explain the conventions and customs of the Sto:lo nation. Visitors will learn to decipher totems, hear stories written in blankets of mountain goat hair and see an ancient log house older than Egyptian pyramids. Continue east from Vancouver and follow Highway 7 into the Fraser Valley. This fertile valley runs parallel to the Canada-United States border and is spread between the Cascade and Coast Mountains. You’ll pass countless dairy farms and berry fields along this 95 kilometre (59 mile) stretch of road before reaching Hope. At this point, join the Trans-Canada Highway 1 as it winds its way up the thrilling Fraser Canyon. At the southern entrance of the Fraser Canyon, the quaint and quite town of Yale is one of British Columbia’s oldest communities. It is famous for being home to British Columbia’s oldest church, which was built in 1859. Although this town’s past is not steeped in First Nations heritage, its cultural importance is worth exploring. Continue north on Trans-Canada Highway 1, past the confluence of the Fraser and Thompson rivers. Take the road through the dry, sagebrush valley of the Thompson River and as far as the town of Cache Creek. Located at the junction of the Trans-Canada Highway 1 and the Cariboo Highway 97, Cache Creek can accurately be described as a bustling oasis town in the midst of cactus, tumbleweed, and a desert-like climate. The harsh land gradually gives way to wide rolling grasslands and mountain terrain. Cache Creek has a deep history extending much further back than the gold rush. For thousands of years the Shuswap Nation has inhabited the valley living a traditional and nomadic lifestyle. But when gold was discovered in the 1860s, miners, ranchers and settlers put down roots and firmly established the town of Cache Creek on the map. At the height of the gold rush, Cache Creek was a resting place for travellers on their way from the Lower Mainland to the Interior. Legend has it that the town got its name when visitors began hiding their “caches” in the nearby Bonaparte River while they rested on their journey. Another story tells of a robber who stole gold from a prospector and “cached” it along the bank of the river. From here, follow Highway 97 north along the historic Cariboo Wagon Road through 100 Mile House and Williams Lake. The highway traces a difficult over land route that gold seekers took to the goldfields. Communities along the way proudly keep their vibrant Gold Rush history alive. Approximately 322 kilometres (200 miles) from Cache Creek, you’ll find the picturesque town of Quesnel, the Gold Pan Capital of Canada. This is a great place to take in the surrounding mountains and have a long lunch before setting off again. Return to Highway 97 and follow the road 124 kilometres (77 miles) north into the “northern capital”, Prince George. Thousands of years ago, the Carrier Indians realised that Prince George was an ideal place to settle down. The confluence of the Fraser and Nechako Rivers created the magnificent wildlife that supported nomadic inhabitants and eventually encouraged trade and expansion when Europeans first arrived. The Prince George Native Art Gallery is a worthwhile stop on this tour. Here, artists from many regions showcase the culture and traditions of the First Nations People. Drive 100 kilometres (62 miles) on the Yellowhead Highway 16 west to Vanderhoof. The geographical centre of British Columbia, Vanderhoof has its roots as the first permanent agricultural settlement of the province. Fertile land and dense forests drive the economy here as cattle, buffalo, dairy farming, logging and tree planting provide the major sources of income. Here, you will come across a friendly blend of loggers, farmers, and cowboys. By heading north along Highway 27, you can take a side trip to Fort St. James, home of one of the province’s National Historic Parks. Trading posts are an important part of First Nations history because they commemorate instances where First Nations trappers would have traded wolf, beaver, lynx, and even cougar pelts in exchange for European luxuries. After travelling back down to Highway 16, continue 128 kilometres (80 miles) west through the wetlands and streams of the lakes district. You are heading deep into fishing territory, where communities like Burns Lake and Houston attract anglers from around the world. Further up the road, you will reach the city of Smithers, an alpine-themed year-round recreation hub. Its red brick walks and Bavarian storefronts are well suited to its location in the shadow of snowy Hudson Bay Mountain. The three Hazelton communities (Old, South and New) are home to ‘Ksan Historic Village and Museum. Located at the confluence of the Bulkley and Skeena River, the site is a cultural centre dedicated to Gitxsan culture and heritage. This prominent site features an immaculately replicated Gitxsan village of longhouses and massive carved totems. The best way take in the site is by guided tour. Visitors are led through the various timber structures, museum and carving school while interpreters explain traditional Gitxsan legends and beliefs. Two worthwhile side-trips off Highway 16 are to the small communities of Kispiox and Gitwanyow. 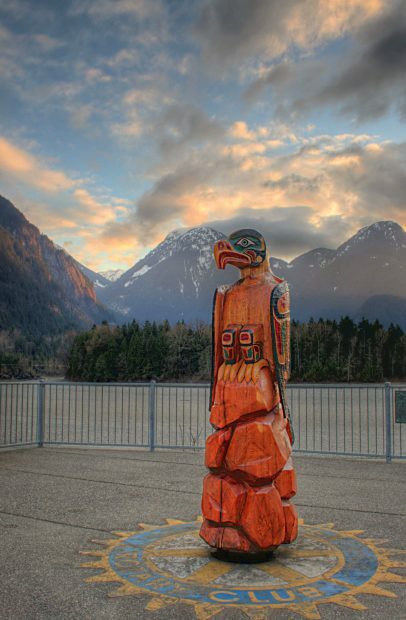 Kispiox is up the Skeena River from Hazelton, where 15 magnificent totems stand. It is a town well recognised for its steelhead fishing and esteemed Gitxsan artists. A little north on Highway 37 is the village of Gitwanyow, home to some of the world’s oldest totems. A unique feature of the community is a carving shop where new totems are created and the oldest are taken down for restoration. Back on Highway 16, head 145 kilometres (90 miles) west alongside the magnificent Skeena River until you reach the city of Terrace. Terrace is eager to show its past, as historic totems are scattered throughout the town. Tsimshian artists are kept busy by a renewed local interest in their work, which can be seen throughout the gift shops and galleries in the small city. Tsimshian influence is even greater just 145km (91mi) downstream in the port of Prince Rupert, and visitors should plan to spend more than one day exploring the city and its heritage. The Museum of Northern British Columbia is operated in cooperation with the Tsimshian people, and its main exhibit focuses on their stories and communities on the misty west coast. Visitors will enjoy the contrast between contemporary pieces of glass art alongside centuries old wooden masks and totems. This is a great place to view exhibits that portray Northwest Coast history and culture dating back to the end of the last ice age, including magnificent displays of art from the esteemed members of the First Nations Carving Shed. Before leaving Prince Rupert take a Harbour tour on a guided exploration of surrounding petroglyphs and ancient villages. From Prince Rupert, BC Ferries offers sailings to Port Hardy on Vancouver Island and Skidegate, on Haida Gwaii. Visitors who are want to explore British Columbia’s First Nation culture should not pass up the opportunity to travel to Haida Gwaii. Standing alone and isolated in the Pacific, the stormy archipelago is the traditional home of the enduring Haida nation. Its people count for half of the islands’ population and all its forms of culture and arts. Make sure to visit the Haida Gwaii Museum, a facility dedicated to the conservation of human and natural history of the Haida Gwaii. The many exhibits focus on the history, culture and art of the Haida as well as addressing contemporary Haida issues and exhibiting the work of present-day art. Collection highlights include contemporary works by artists such as Bill Reid and Robert Davidson, a comprehensive exhibit of birds and mammals, and the world’s largest collection of argillite carvings. Argillite, a traditional carving material, is a slate black rock found only on Haida Gwaii. The southern third of the archipelago has been protected as Gwaii Haanas National Park Reserve and Haida Heritage Site. It offers an inspiring glimpse of rugged coastal beauty blended with rich coastal ecology. An astonishing reserve, this park encompasses 137 smaller islands of the Haida Gwaii archipelago. More than 500 ancient Haida sites can be found among these islands, which offer a glimpse into the past of BC’s predominant aboriginal peoples. To access the park, visitors would be wise to plan several days in advance. Special arrangements by boat or plane should be made, as there is no vehicle access. Visitors who invest the time to discover the deep heritage of Haida Gwaii will be handsomely rewarded. Here, there exists a unique opportunity to peer into 10,000 years of history left behind by the Haida nation. Exploring the Gwaii Haanas National Park is arguably the number one reason for coming to – and returning to – Haida Gwaii. On the southernmost island, Anthony Island, stand what have been described as the world’s oldest standing totems. The ancient village site has been declared both a National and World Heritage Site. But despite this worldwide recognition, the Ninstints site remains one of the most remote and inaccessible parks in British Columbia. After exploring Haida Gwaii, you must return to Prince Rupert to sail the Inside Passage south to Port Hardy. Touted as BC Ferries’ “one-day cruise”, the 507 kilometre (314 mile), 15 hour journey down the coast of the mainland provides one of the best vantage points for admiring the mountains fjords and rainforests of the west coast. The rugged coastline exposes its snow-capped mountain ranges and an abundance of wildlife. Passengers may catch a glimpse of whales and dolphins, or even a rare Kermode bear. Offering far more than a transportation link, the route is popular for having opened up scenery that was previously inaccessible to most British Columbians. You will arrive in the fishing community of Port Hardy. With only 5,000 residents, it caters mainly to those catching the ferries to and from the mainland. However, this region has much to offer outdoor recreationists. With over ninety percent of Vancouver Island’s population centered on the southern half of the island, those wishing to find solitude and peacefulness escape north to communities such as Port Hardy. Drive south 44 kilometres (27 miles) along highway 19 to the scenic waterfront town of Port McNeill. The area around this small community is teeming with all kinds of wildlife. Eagles, sandpipers, and herons fish along shores while sea lions, porpoises, and whales frolic in the waters. Ferries run to the community of Alert Bay on tiny Cormorant Island, home to the Kwakwaka’wakw nation. The U’Mista Cultural Centre was created to ensure the continued survival of Kwakwaka’wakw heritage and culture in and around Cormorant Island by showcasing the amazing history and artistry of the people. This unique centre holds many beautiful ceremonial masks, paintings, and carvings. Outside, the world’s tallest totem pole towers over the centre’s grounds. Ferry back to Highway 19 and drive south into Campbell River. A mining and forestry town at heart, visitors come here to experience the eco-tourism adventures on and off the water. For thousands of years, First Nations people have lived here in numerous small villages along the coast and have depended on the annual salmon run for survival. The salmon were such an important resource that they held a spiritual significance in everyday life and were honoured through art, song, and dance. Nearby, Quadra Island holds more artifacts from the Kwakwaka’wakw nation in the Kwagiulth Museum. Its fascinating collection of potlatch items was confiscated by the Canadian Government after the celebration was banned in 1921. The pieces were only returned 60 years later, long after the ban had been lifted. This collection includes magnificent masksa, blankets, and jewelry. Travel down the Island on Highway 19 198 kilometres (128 miles) to the city of Courtenay, the access point to Strathcona Provincial Park. Through recent additions, the park almost stretches across the whole of Vancouver Island. Within its boundaries are Mt. Golden Hinde, home of the island’s tallest peak and Della Falls, Canada’s highest waterfall. Neither of these attractions are easy day trips; however, Forbidden Plateau is easily accessed and provides some of the province’s most outstanding alpine hiking trails. Continue south to Nanaimo, a bustling city with a busy port, clean parks, and lively museums. Everyday at the Bastion, the Noon Gun is fired in an elaborate costumed ceremony. Marking a past of colorful colonial control, the fort houses artifacts and history from the city’s origins as a Hudson’s Bay outpost. BC Ferries sails from Nanaimo to the mainland, but the tour continues south through the picture perfect communities further down the island. Artists from around the world come to Chemainus to paint giant murals and turn the streets into an outdoor art gallery. Stroll through the charming downtown and find 33 murals that changed not only the face, but also the livelihood of this small community. Sculptors, potters, and painters continually congregate to the seaside town to take in the ocean-side views and dynamic creativity of other artists. Just 17 kilometres (11 miles) away in Duncan, the Cowichan Native Village is open to visitors year-round. Join a traditional smoked salmon lunch feast where dancing, story telling, and artists tell the history of the Cowichan people. The centre offers an authentic First Nations Experience with interpretive tours, traditional art, and other cultural attractions. Throughout the village 80 totems stand; most are traditional, but the collection includes a few contemporary carvings. The Rick Hanson Man-In-Motion-Pole, for instance, was carved to commemorate the completion of Rick Hanson’s round the world wheelchair odyssey. Victoria is the southernmost city on Vancouver Island and the final destination on the tour. Celebrate your arrival with afternoon tea at the Empress Hotel, and then stroll through the city’s urban parks, where totems from many of the west coast native peoples stand. Their presence amidst the city’s Victorian architecture add to the west coast’s eclectic personality. Finally, bring the past back to life and explore British Columbia’s amazingly diverse history at the Royal British Columbia Museum.